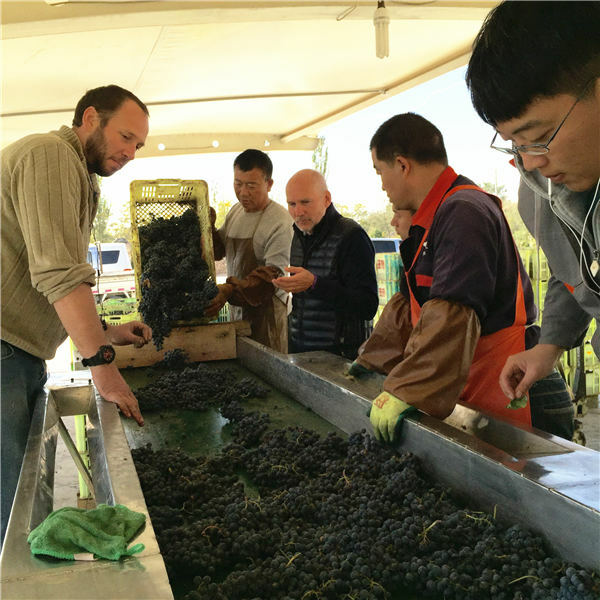 As Ningxia's best wines celebrate a decade of attention-getting quality this year, Mike Peters stops in for the year's last pickings. The grapes that Mike Insley is plucking are not the fat table grapes that were favored in Ningxia just a generation ago. They are smallish, the size of blueberries, and their flesh is sweet as your grandma's pie. Insley is delighted. "These are 24 to 25 brix," he says, referring to the percentage of sugar reached last weekend, the final days of the harvest for most wineries around Yinchuan, capital of the Ningxia Hui autonomous region. But as I greedily pick another sugar bomb to taste, Insley's interest moves deeper. Spitting out the sweet pulp, he's now chomping down on the seeds with epicurean gusto.